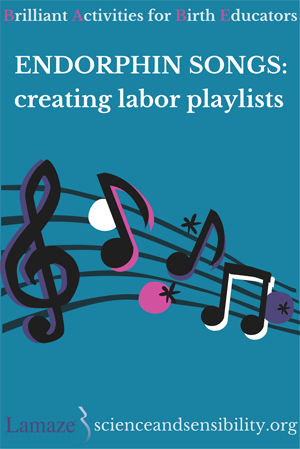 This month's Brilliant Activities for Birth Educators idea involves introducing your classes to the idea of a labor playlist. 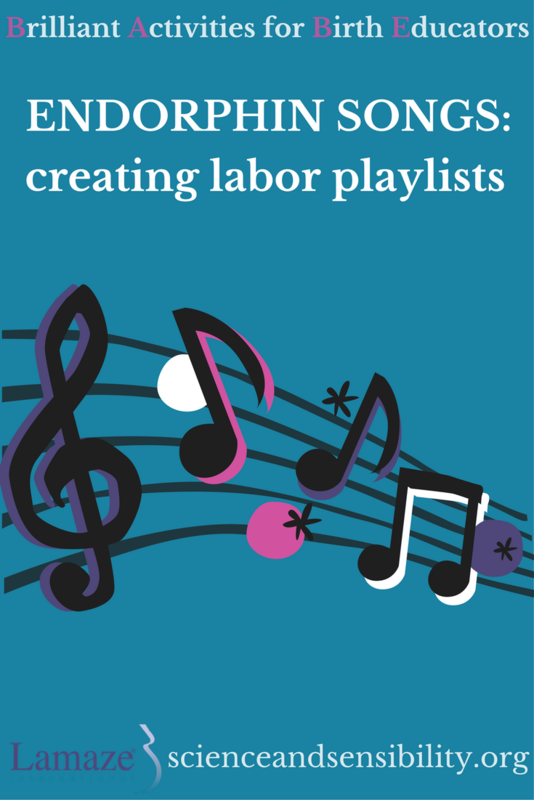 The concept of a labor playlist is not a new one. Using music to help you calm down, even in labor, is a very old idea. In fact, studies have proven that when music was present during labor, women reported significantly lower pain and anxiety. What has changed in recent years is the dramatically different ways in which we consume music in general. This has definitely been one way in which technology has actually been very beneficial in the labor room. You can see all the Brilliant Activities for Birth Educators by clicking here. When I first started out as a doula, laboring families were hauling boom boxes (Yes, boom boxes. ), into labor room simply to be able to hear music. Then we either had to suffer through listening to the radio, with commercials or find cassette tapes and eventually compact discs. The same went for class. If I wanted to play one song for a relaxation practice in Lamaze class, I had to bring something to play it with and the tape or disc on which it was stored. Thankfully we don't have to do that anymore and we can have a much broader variety of music available to us without all of that hassle. Now, we can do all of this and more, typically with something slightly bigger than a deck of cards. Not only have the devices gotten smaller, but now we can also carry days worth of music in that palm-sized gadget. This allows me some freedom as a childbirth educator to change my mind in the middle of class as to what song I want to play, because sometimes, I'd be in the middle of teaching and I'd realize that the song I normally used wasn't going to be quite the right fit for the group that had shown up to class. I don't have to worry about that now. I introduce the concept of a labor playlist by talking about hormones, particularly endorphins. We will have already talked about the hormones in labor and how their role is crucial, so this is a chance for me to reiterate that knowledge. I explain how music is used to set the mood or tone for lots of different occasions and events in our lives. I ask them to think of soundtracks from movies and how that drastically changes the tone. Would Jaws be as memorable with the classic sounds of the impending shark that most people could identify, even if they hadn't seen the movie? It's pretty easy to name songs from movies. We also play music at sporting events. There are whole bands that travel with various sports teams to provide that music, along with the loud speakers blaring energizing music. And we also play lots of music at weddings, with families spending days pouring over song lists to choose just the right song for the right moment. So it only makes sense to think about music for labor. I talk about endorphin songs - the songs that make you move or sing along, no matter where you are or no matter who is with you. I jokingly tell them that this is where I find out where all my secret Britney Spears fans are hiding. Songs that make you move or sing are ones that help you produce endorphins. Many of these songs hold special meaning to the people. Perhaps they were songs that were popular at certain times in their life or were played at prom, or some other big event. Maybe it just happened at a sensitive time in their lives - it doesn't matter - they all work. My advice is always to choose two playlists - a faster playlist, one that makes you want to get active and move and a slower playlist, one that helps you calm down and relax. While I'm often asked what's the best music for labor, I explain why it doesn't work that way by giving them a quick example that is a lot of fun. I hand out red and green strips of paper and I instruct them to raise the green strip if they feel like singing, moving, or tapping their foot when a song comes on. They are to raise the red one if none of those things happen or if they feel a lurch when hearing the song. I then play snippets of about 15-20 various songs. It takes about five minutes, but the mood in the room is always lighter when we're done and I point out to them that we're all feeling a bit more spirited even after a few minutes of just clips of music that maybe we didn't even like half of it. Their homework that week is to work on their two playlists together. This segment is often cited as one of the favorites from class and when I ask after they've given birth, nearly 100% of my students report using music for at least part of their labor with nearly all of them saying it was helpful. Robin is an independent Lamaze Childbirth Educator and doula practicing in Louisville, KY.